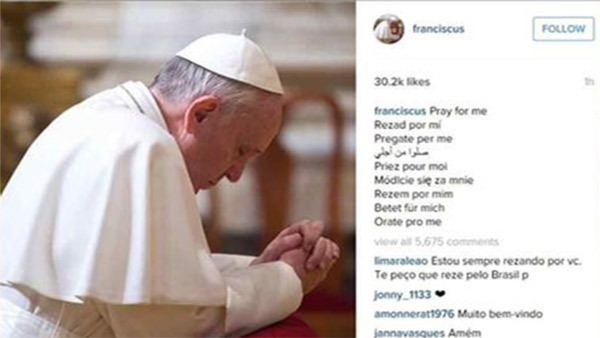 VATICAN CITY (WPVI) -- Pope Francis is expanding his presence on social media with an Instagram account. The pontiff, who has nearly 9 million followers on Twitter, made his debut Saturday on Instagram, a photo-sharing site. The image shows Francis kneeling with his head bowed in prayer. "Pray for me," the caption read in nine languages. On the eve of the launch, a Vatican communications official, Monsignor Dario Vigano, told Vatican Radio that the pope believes images can reveal many things. Vigano also said that the Instagram account will allow people to share the pope's "gestures of tenderness and mercy." The pope's account will use the name Franciscus, his name in Latin.